I am doing SDS page for my sample. I use dignam buffer for lysis. Protein quantification shows spec reading (something around 1.125) after that I heated my sample at 95c for 5 min. I am loading 15micro/g per well. but to my utter realisation I am not getting a single band after staning. I ntocied one thing after sample kind of agglomerate i can see in my sample. Can someone tell me what wrong I am doing. I did all pH checking and evrthing. I dont know what is the problem? If it is a sticky agglomeration, then it is probably DNA that is the problem, try using a smaller amount of input cells or bacteria per volume of lysis buffer. You can also try heating to 70 C for 15-20 minutes and see if that helps, rather than boiling the sample. did you boil in sds loading buffer? if not then you denatured (read "aggregated") your protein. Bob, no its not a sticky agglomerate. I changed the protocol this time and now I am heating at 37 in presence of sample buffer for 30min. BUt I am facing a new issue. I ran gel this time and got bands but the bottom of the gels are quite blank. I proceeded with western blot I got expression but at wrong place. Why is this so? mdfenko, yes earlier I boiled without buffer. but I dont think the sample are degraded. What I did was i made a shot spin of that sample and collected the supernatant and ran a gel I got bands. If it would have been degraded why would I get the bands. But yes next time I will heat at 70c. However I have a new issue. I have changed my protocol and now I heat at 37c for 3o min in presence of sample buffer. 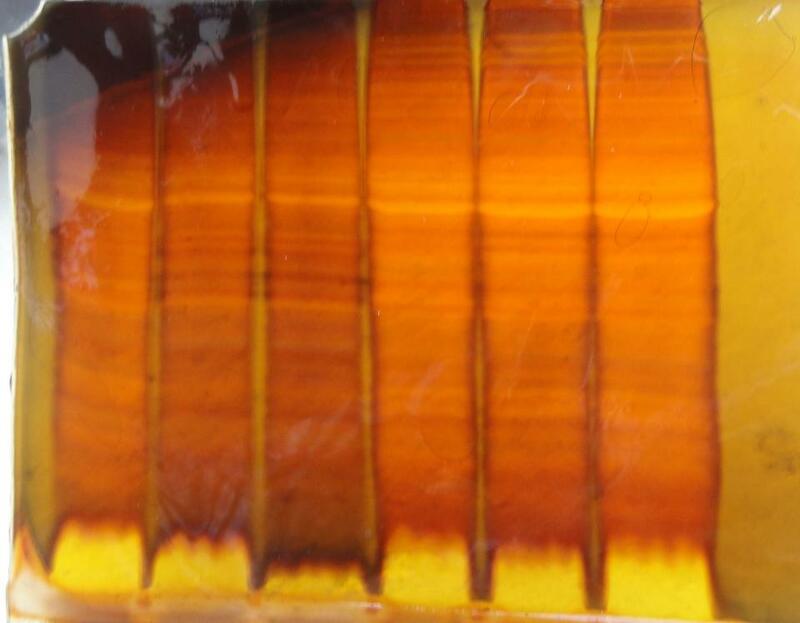 after the gel I observed that bottom of gel is quite balnk with faint bands. I did western blot also but I got expression but at wrong place. Why is this so? 37 for 30 is not enough to linearize the proteins, so they won't migrate at the expected size. As to the faint banding in the lower part of the gel... is this by western blot (or ponceau on transferred membrane) or by coomassie staining on the gel? If it is ponceau/WB then the problem may be that you are transferring through the membrane. If on the gel, it could be a number of things including incorrect pH of either the gel or the running buffers. How does the sample dye look as it runs? i said "denatured" not "degraded". denatured is often aggregated. this can lead to: inability to enter the gel; slow migration; streaking; combinations of these and other possible effects. spinning after heating should remove the bulk of insoluble aggregates but some, especially smaller aggregates, will stay in the supernate. by "wrong places" do you mean apparently heavier (slower migration) or lighter (faster migration)? regardless, these effects could be due to inefficient denaturing with sds. I heated my protein at 70c for 10min in presence of sample buffer and ran gel. I got the same results as earlier (no bands in the bottom of gel). Please advise. if you are talking about those "clear" areas at the bottom of each lane, those are caused by the buffer components of the sample (presumably your lysing buffer) and/or lipids in the sample. would you give details of your lysing buffer, sample, sample preparation for sds-page, and anything else you feel may be relevant? Lysis buffer component: DTT, PMSF, MgCl2, KCl, HEPES, nonyl phenoxypolyethoxylethanol (NP40). sample buffer component: Tris, SDS, Glycerol, Bromophenol Blue and betamercaptoethanol. I am using tissue homogenate. what tissue? does it have a high lipid content? np-40 can cause the clear areas (as can triton). it can also interfere with ads binding. you may want to dialyze (you can perform drop dialysis on a sample sized aliquot) away the lysis buffer prior to addition of the sample buffer.